Tonight I’ll listen to some Widor and Franz Schmidt`s opera. What a horrible, tragic event. I too thought of Schmidt’s Notre Dame. I’ve been watching it live on CNN. I hope no one was killed. Olivier Latry is titular organist at Notre Dame and is one of the greats. I am hoping to see word of his well-being. He was on tour in Vienna when a friend sent him the news. Listening now to Pierre Cochereau playing the Cavavaille Colle organ, which I hope has survived, but I fear will be badly damaged at the very least. A personal tragedy for Latry, the greatest of all improvisers. But a great challenge to design and build an equally great, even better instrument. So many will have memories and deep feelings tonight with this very sad event. 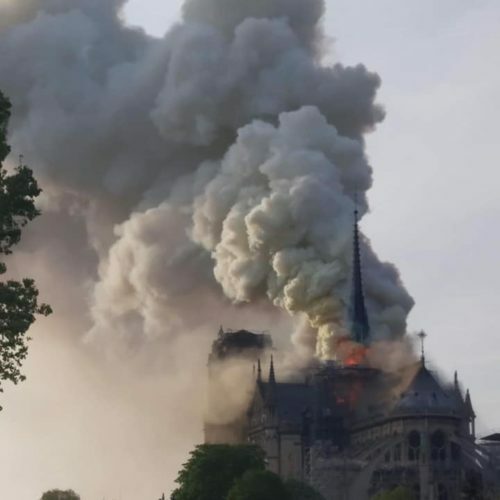 Such a shock – Notre-Dame is one of the most historical buildings in the world. A great tragedy on every level. Absolute catastrophe. I’m heartbroken and inconsolable. It will not be rebuilt in my lifetime. Not the time for sensational headlines and uninformed assumptions – the known facts are terrible enough. MSNBC’s Richard Engle is supposed to have reported an hour ago that the windows and organ are saved. One desperately hopes this is true. More hard info on the organ would be more than welcome – up to now it has been almost nonexistent. Apparently, the organ has survived mostly undamaged. A miracle. “Destroyed by fire” is a surprising common phrase in the history of these cathedrals that are famous for their stone architecture. It won’t be cheap but it can be put back together. The spire that fell was a 19th Century addition. The original also had a spire but the 19th century renovation made it larger. It was destroyed in the fire. The Germans completely and beautifully rebuilt the Frauenkirche in Dresden after it was bombed in WWII. Let’s hope the same thing results with ND. I watched in disbelief. The severity of the flames seemed to indicate nothing would be left. Thankfully the main bell towers remain intact and mercifully no-one was killed. It all made me wonder: how many British Cathedrals might be in danger of a similar sort of unexplained fire? Have patience!! Explanation is coming, IF Macron allows the truth be told!! Otherwise, tears, prayers and more tears, and then memory weakens! I doubt there are naive people who believe it was an accident – “someone threw a cigarette on the floor”? So, have patience. We will see what the investigation shows, again IF Macron allows it to be shown. The french term ‘nonchalance’, which has intrernational currency not without reason, is enough explanation. The sarcastic weekly Charley Hebdo has already published their insinuation that the fire was part of his measures to reform France, totally nonsensical and tastless and not humorous at all. Please, please, John. Don’t comment on Charlie’s humor, it escapes you completely. Yes, I know, but still don’t find the Charlie Hebdo humour funny or amusing at all, and their other attempts at making their readership lauch strike me as merely primitive and juvenile. I read that they could save the works of art, but noone mentions the organ. Was it destroyed? Seemingly not really, although they’ll have to take it all apart for a thorough cleaning. The commotion, not ony in France but also internationally, is due to the symbolic value of the building. 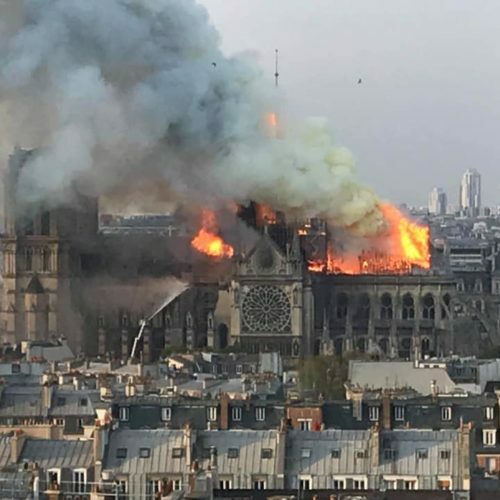 But only the wooden roof, spire, small part of the central vault and a small glass-stained window have been destroyed / damaged. Thanks to the firefighters the overall stone structure has remained stable which means that it can all be restored and / or reconstructed. The president, just about to deliver his most important speech since his election, live on TV, behaved exemplarily, immediately postponing the speech and hurrying to the site, and finding all the right words in his comments. The wave of support, moral and financial, national and international, proves how important ancient monuments are for the present and the future. I don’t think an object like the Philharmonie would ever be able to spark such sentiments. And during Holy Week as well – the most solemn time for Christians of all denominations but never more than for Catholics abroad. Notre Dame was not a museum or a concert hall but a working church. Just awful for those Catholics in particular but a great loss for everyone else. Norman, where and how may one contribute to a rebuilding fund? This should be a worldwide effort.